I haven't posted in a very long time, but decided to come back and finish my Sims 3 Uglacy. Originally I wrote the Uglacy on Sims 2, and yes, I still have Don the Zombie saved forever on my external hard drive. Maybe one day I shall unleash him again. In the meantime, I wanted to finish the Good, The Bad, and The Uglacy and see how ugly sims 3 could get. So far I have to be honest and say I miss the Sims 2, and Sims 3 just doesn't have the Sandy Bruty and Goopy selections I came to love and know, but I'm trying. I haven't even bought Sims 4 yet. Anyway, I returned to Boolprop because it has always been my favorite forum. So here it is up to Generation 3. Chapter 14, College Days Are Here Again! Chapter 1. The Good, The Bad, and The Uglacy. Chapter 2. Red Plumbobs for Everyone! Chapter 3. Second Generation Fun! Chapter 11. A Brand New Year! Chapter 12, The Glitch Wars! Last edited by Candi0207 on September 9th, 2018, 3:34 pm, edited 12 times in total. Finally read this all the way through! Woo! 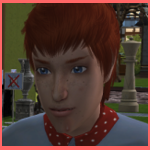 I should have guessed you'd get ugly looking sims only by the 11th chapter...I'm excited to see how far you'll take it. I love all the Sims and how you write them, and of course the cowboy theme. Kitty's...beautiful. I can't wait to see you continue! And what the hopeful future spouse Greenface McElphabaIforgothername makes the sims look EVEN BETTER. Thanks so much pucks for commenting. I was beginning to hear crickets chirping, lol! Great update. That's funny about the fire. The firefighter ran off! I know it's been over a year since I updated this story but I really thought I lost it with the last crash I had. However, I was able to save it, and it's up and running again. I'm not sure I'm liking the picture layout on the dark wood background at Wordpress. Tell me if you think it's hard to read. Thinking about changing it. I was doing slideshow but it kept cutting off text. I could do that again, not sure. Decisions, decisions. So, I discovered this and binge-read it. Fantastic! I love your uglacies, Candi! You know how to make ugly beautiful, and awkward endearing. Also, hilarious! I hope you update, after all. I haven't posted in a very long time, but decided to come back and finish my Sims 3 Uglacy. Originally I wrote the Uglacy on Sims 2, and yes, I still have Don the Zombie saved forever on my external hard drive. Also, I wanted to finish the Good, The Bad, and The Uglacy and see how ugly sims 3 could get. So far I have to be honest and say I miss the Sims 2, and Sims 3 just doesn't have the Sandy Bruty and Goopy selections I came to love and know, but I'm trying. I haven't even bought Sims 4 yet. Anyway, I returned to Boolprop because it has always been my favorite forum. I just read Chapter 15. So good to see this continuing! Wow. That is some bad luck with the dormies! So much fire and so much mess, and they Just. Won't. Go. Away. Have you tried calling the "Roommate Services" on the phone to lower the number of roommate slots? Sometimes that can help. Frankly, I avoid roommates in this game. This was very funny, though, as always. YOu're such a good writer, with really engaging characters. Oh wow...I thought it was just me with random roommates just appearing. Well you got through college...not sure how many sims I'll take as it's actually more tedious than Sims 2...I was hoping I'd like it, but not really. It's sweet Josey and Jennatte are so in love. They do look like they make a really great couple. And oh Candi your stories never fail to leave me rolling on the floor.